In conjunction with Grab’s 4th Anniversary Celebration, we would like to thank you Malaysians for supporting Grab for the past 4 years! & Johor Bahru as our present for you. We would like you to continue supporting us for many more years to come! There is one more gift that we would like to give you for our 4th Anniversary Celebration! A promo code to get you going to places with us, Grab. Valid in Klang Valley, Penang & Johor Bahru only. Here’s How to Book Your Ride! 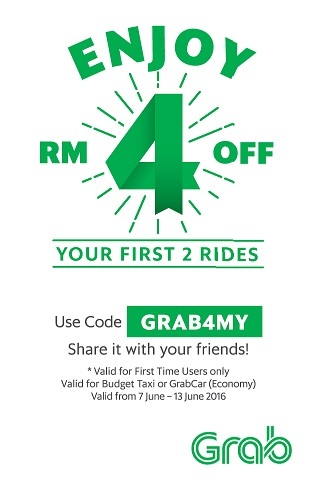 This promotion is only valid for Grab(MyTeksi) users. All bookings must be made via the new Grab app. Valid for Budget Taxi and Grab Car (Economy) only. The Campaign will run on 7th June 2016 – 13th June 2016 (“the Campaign Period”). The Organiser reserves the sole and absolute right to alter or end the Campaign at any time prior to the expiry of the Campaign Period without giving any prior notice and no compensation in cash or in kind shall be given. Participants can enter the Campaign by downloading Grab’s mobile application (iOS, Android). Participants are required to include their name, mobile phone number and email address for further communication and verification purposes. Just go to ‘Profile’ to register and activate your Grab(MyTeksi) account. Grab shall not be liable for any claims by the Customers or third-party claims or loses of any nature, including but not limited to, loss of profits, punitive, indirect, special, incidental, or consequential damages or for other damages and any related claims of any nature, including direct, indirect, third-party, consequential or other damages resulting from or in connection with this Campaign. THANK YOU MALAYSIA FOR SUPPORTING GRAB!